If you still have to face the daunting task of converting all your old boxes of vinyl singles, 12-inches and LPs into MP3s then Denon just made the task around a million times easier, with the new Denon DP-200 doing all the hard work for you. That's right. This is no standard USB turntable. The DP-200 converts, encodes and saves MP3 files directly to USB stick. "The killer app is that it automatically labels and tags your MP3s for you," reports Urbandaddy. How does it do this? By simply "using the same software iTunes does." So. A vinyl-to-MP3 converter that automatically assigns artist names, album and track titles. 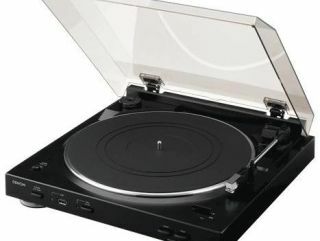 A must for audiophiles and vinyl junkies, everywhere, TechRadar is sure you will agree. For more on the $250 (£170) DP-200USB head over to Denon's website. US customers can buy one right now from Amazon or Crutchfield.